Oooooh boy is summer here! It's hot hot hot and the best way to cool down is with a popsicle!! 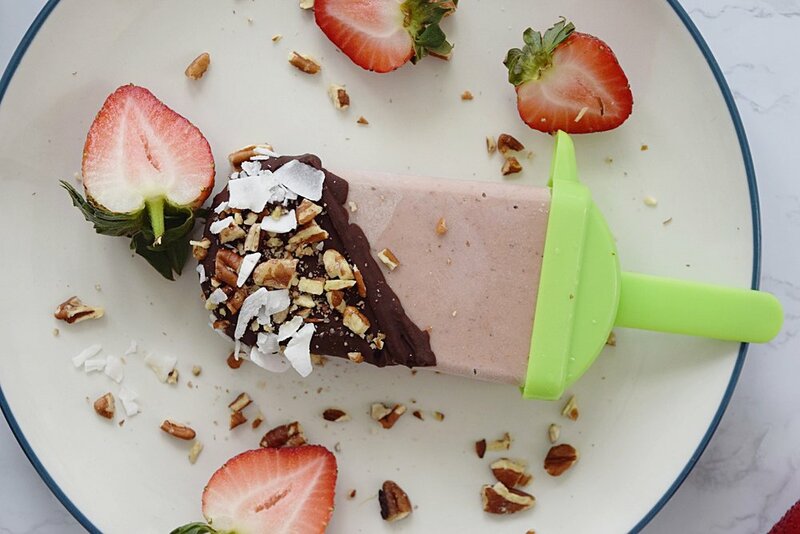 These healthy popsicles not only have an amazing flavor, but they are extremely filling as well. I added honey into the recipe, but you could definitely leave it out. I think they are sweet enough without the honey, but you definitely have the option to sweeten them up! I used melted dark chocolate with crushed nuts and sprinkles for my toppings, but feel free to play with the toppings. I think that melted peanut butter drizzled over the top would taste amazing as well! In a blender, add all ingredients except for toppings. Pour into a 4 count mold and freeze overnight. Remove from mold and melt dark chocolate. Dip in desired toppings! Freeze until ready to eat. Allow me to introduce you to the most decadent energy bite I have ever made! 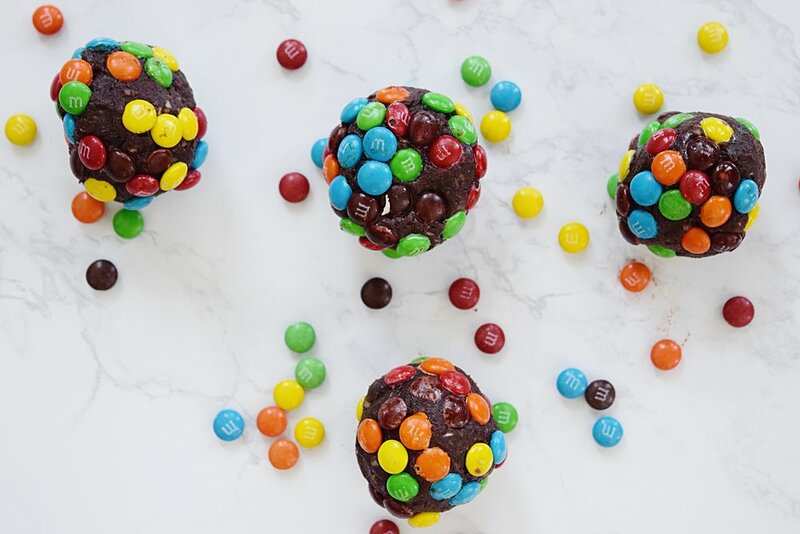 Chocolate packed brownie batter bites are my favorite way to recharge after a workout or crush a persistent sweet tooth! The base of this bite is an old Whole30 chocolate cake recipe I had tinkered with back in October. The cake failed miserably, but removing a few ingredients made a fudgy delicious energy bite!! The process to make these is super simple. Stir, roll and refrigerate! I like to roll my bites in mini m&m's for fun, but crushed walnuts, coconut flakes or crushed graham crackers make excellent coatings as well! Be sure to keep these refrigerated as they don't hold up well to heat! Add cashews to food processor and pulse until nuts are a super fine crumble. Add coconut oil (measure after you melt), cashew butter and cocoa powder and blend to combine. Add dates and blend until mixture is thick. Add water to thin if necessary. Use a tablespoon to portion and roll into balls. Roll in desired toppings and refrigerate. Oh.my.word...this recipe is so ridiculously easy to make and tastes amazing! Last week I had a craving for a pudding that hit my sweet tooth but also made me full! So I started with a base of sugar-free/non-fat pudding, vanilla protein powder, added in some pureed pumpkin I had in the fridge and BAM! It all came together! I also added crushed graham crackers and some leftover toasted pecans I had and that really took it over the top! I think next time I make this I might even try adding some cooked and mashed sweet potatoes. I would eat this as a dessert or as an afternoon snack on a day when I am really needing something sweet yet filling. I did a fast calculation on the calories and for 1/2 cup of the pudding it's right around 200 calories! I'll take it! In a large bowl whisk together dry pudding mix and protein powder with coconut milk. Add more coconut milk if mixture is too thick. It should be smooth but not watery! Add in pumpkin and whisk to combine. Refrigerate pudding until set, about 5 minutes. 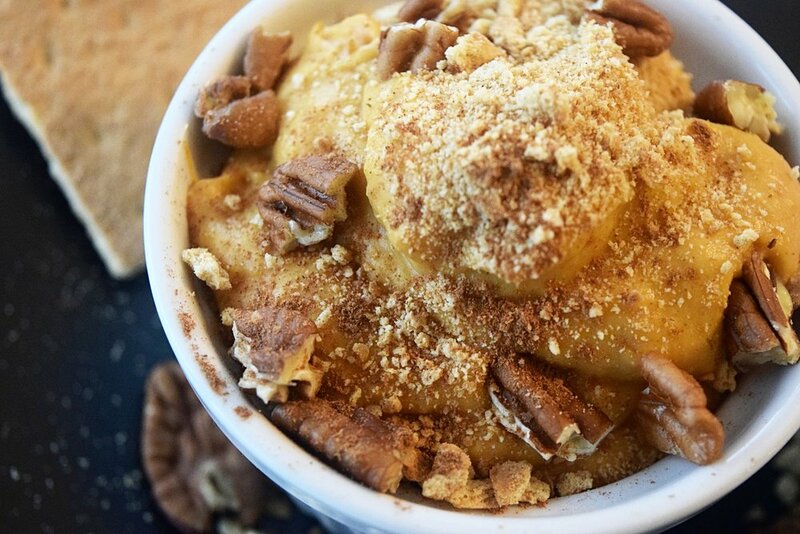 Serve with graham crackers and pecans on top!